Why world is choosing between puppy or baby? 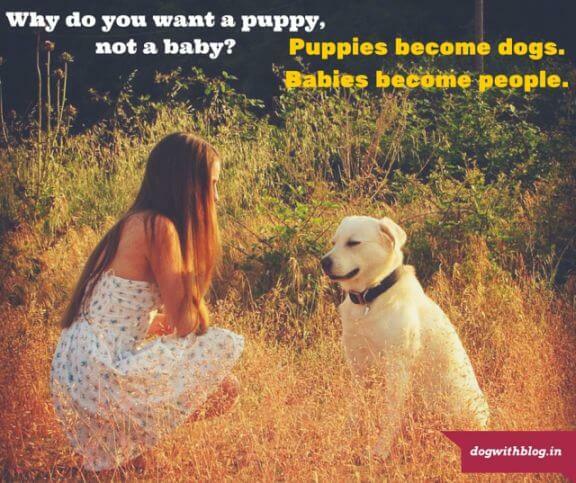 Why do you want a puppy, not a baby? Puppies become dogs. Dogs are fun. But, so are the babies. Babies become people. People are dumb. Some of the questions that haunt us aren’t a device of our making, but that of the world. Consider this ― When are you getting married? and god forbid, if you are married, When are you expecting a baby? What about the questions that matter, something on the lines of Mary Oliver – what one wants to do with his or her wild and precious life? Like the other deeply conflicting debate: Which came first, egg or the chicken Humans these days are choosing puppy or baby (that is when they can’t have both). From Italy to the USA, the birth rate hit an all-time low. The stats were so staggering that even Pope Francis publicly warned married couples against substituting pets for children. He also suggested that such couples have been too strongly influenced by a “culture of well-being” which promotes the idea that life is more enjoyable without kids. This dog isn’t suggesting that a puppy is the replacement for a baby, but shouldn’t we leave this choice to pet parents? Why drag religion into it? For pet parents treat their dogs like babies. Furthermore, what about the countries where population growth rate is still far from under control, I am all for having dogs, provided you adopt them. Scientific research has also led to conclusive evidence that dogs and babies share some common traits. Japanese scientists have found that the “mutual gaze” between dogs and their owners stimulates the same bonding process (release of oxytocin) that occurs between the mother and child. While Researchers in Hungary concluded a study that shows that dogs respond to eye contact and verbal and nonverbal cues from humans similarly as a human baby would. So for all of you out there who say your dog is like your baby, you may be more right than you thought! Okay, good luck with diaper changes and tantrums, I would rather have my doggy ‘kid’. Posted on September 24, 2015 February 9, 2018 Author Abhishek JoshiCategories Funny bones! I’m a cat person, but I agree with you. My cats are my babies and I can’t imagine lifee without them. Kittens grow up to be cats, and cats are still adorable and lovable after they grow up. My oldest daughter is one of those humans who was cute as a baby but she grew up to be a very mean person. At least two of my children are putting off the decision to have a baby, and I support them completely. I’m totally happy to spoil their cats as they are my GrandCats. I agree – and cats are quiet and clean, dogs are smelly and noisy. cats don’t need to be walked. cats eat less than dogs, and they cover up their poop. As far as smart/intuition: cat would never submit to being hooked up with seven other cats to pull an eskimo sled. Cats are definitely cute and rule the internet but dogs rule human hearts. Saving the world from detonators, depression and diehard terrorists, dogs are more important to the world than any other animal. Previous Previous post: Have You Heard of The World’s Most Awesome Train?